7,000 Total numbers of ANM Staff Nurse Recruitment post vacancy notification has been released online, so if you wanted to fill up online [highlight color=”yellow”]BSSC staff nurse vacancy 2016 application form[/highlight] then you would be available to apply online form only by followed up direct link mention below on this page. 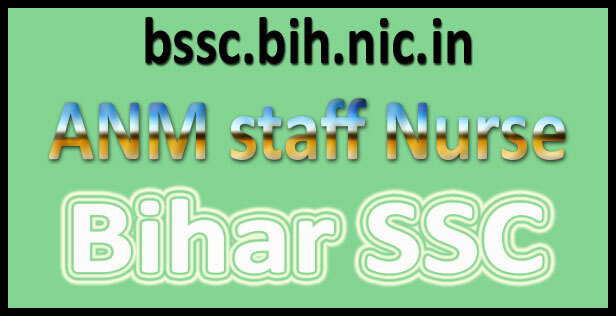 Bihar SSC staff nurse recruitment 2016 is so much precious and important news for all those aspirants those who were in search of latest Paramedical Recruitment Job Vacancies in Bihar state, Now if you have decided to fill online form then exactly you can apply online form only by visiting BSSC Site and fill online form by paying online form fee. Aspirants of Bihar State must be so much happy with today’s news that Bihar Staff Selection Commission (BSSC) has just announced the recruitment of 7000 ANM Staff Nurse. This is the announcement for all those aspirants who are waiting for the Government Jobs in medical Field. We are quite sure that interested aspirants are not going to miss this platinum chance. This is the notification for the selection of 7000 Auxiliary Nurse Midwifery Posts in Bihar state. Aspirants can now fill application form online and apply for ANM Nurse Recruitment 2016. We can say that if you are waiting for Government Jobs in Bihar in medical line then your wait is over. Aspirants have the time to apply for ANM Nurse Recruitment 2016 from 24 February 2016 to 15 March 2016. Aspirants do not even have 1 month time to apply for it. A very large number of aspirants will be applied for Bihar SSC ANM Nurse Notification 2016. Interested aspirants have lots of things to know about this such as Education Qualification, Age Limitations, Application fee, Selection process, Salary and more. Those aspirants who have completed ANM Course from the recognized University then they all are fully eligible for the recruitment. All you need to fill the online application form of Bihar Staff Selection Commission ANM Notification with correct details. If you are applying online then this is also important for you all to pay online Application Fee. Final selection of the interested as well as eligible aspirants will be done by the Written Exam and Personal Interview. You all are advised to check all details of Bihar SSC Recruitment 2016 from below. Academic Qualification: This is very important for all interested aspirants to have 10thcertificate, 12th certificate and Auxiliary Nurse Midwifery certification from the recognized Board. If you have all above certifications, then you are eligible for ANM Notification 2016. Age of interested aspirants must be in between 18 years old to 37 years old for all Male aspirants. Age of interested aspirants must be in between 21 old to 40 years old for all Female Aspirants. Age relaxation is also applicable as per the announcement if Government of Bihar state. Application Fee: This is very important for all aspirants to pay Application fee of ANM Recruitment 2016. Aspirants of General and OBC category aspirants will pay Rs. 750 and Rs. 200 for all other reserved category Aspirants. Selection Procedure: All Aspirants will have to appear in the Written Examination and after that selected aspirants will be invited to appear in the Personal Interview Rounds. Salary: Aspirants will get pay Scale of Rs. 5200 to Rs. 20200 per month with Grade Pay of Rs. 2400. Candidates those who had decided to fill online form they can follow up some of easy steps mention below on this page to apply online application form for [highlight color=”yellow”]BSSC staff nurse recruitment 2016[/highlight], So hurry up candidates for now online to apply online application form.